With a popular weekly farmer’s market just round the corner from our new apartment, I’ve been on a bit of a jam making mission over the summer. Both the children and adults in our family enjoy a nice jammy piece (or jam sandwich, for all the non Scots) for breakfast – or lunch, or dinner – so we go through jam pretty fast. 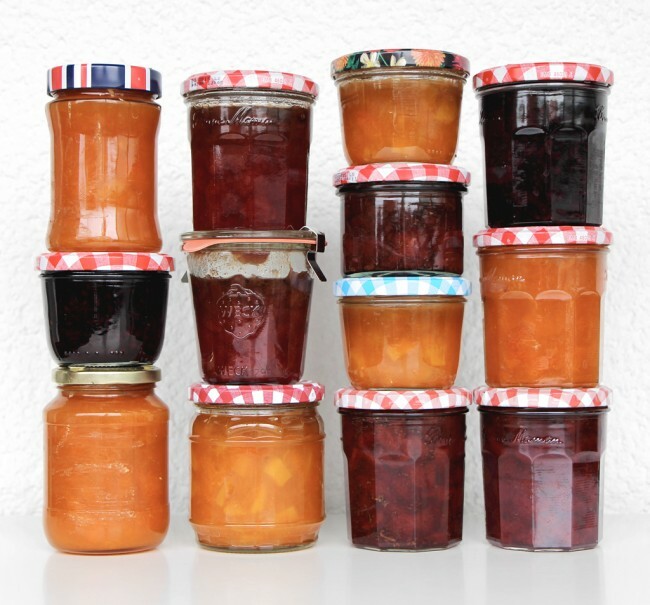 And before the last of the summer fruits and berries disappear I wanted to share some of my fruit & herb jam creations with you, to maybe inspire you to make your own! For the jams above, I used 1.5kg of apricots, 1kg of strawberries and I couldn’t resist a couple of punnets of the brambles that are just coming in. 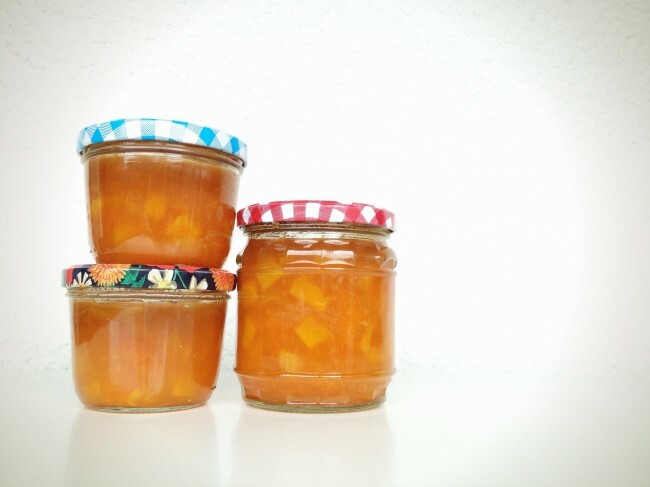 I use 2:1 gelling sugar for my jams, which means you need double the amount of fruit to sugar (e.g. 1kg strawberries, 500g sugar). Gelling sugar, also known as jam sugar or jelly sugar, is a sugar that already contains pectin as a gelling agent. In Germany, it is available in three different varieties – 1:1 (same amount/weight of fruit and sugar), 2:1 (twice as much fruit as sugar), and 3:1 (three times as much fruit). Other than the fruit and sugar, you’ll need some lemon juice and some herbs. I used rosemary, mint and thyme, but the possibilities are endless. Boil your jam jars and lids for 10 minutes in a large pan of water, then leave to dry on some kitchen paper. Cut the apricots in to little pieces and squeeze out the juice of the lemon. Mix the apricots with the lemon juice, rosemary sprigs and gelling sugar. Pop a lid or cover on top and leave to infuse for an hour. After a hour, bring your mixture to the boil, stirring continuously, and keep stirring and boiling for 4 minutes, or according to the instructions on your packet of sugar. Carefully you don’t get burned by any splashes from the bubbling hot mixture! Skim any foam off the top with a slotted spoon, remove the rosemary sprigs, and fill the mixture in to your clean jam jars. Tightly screw on the lids of the jars, and stand them on their heads for 5 minutes. Then turn the right way up again and leave to cool completely. *Or you can just weight out 1kg of apricots and use 500g of sugar, but I wanted to use up all the fruit. Remove the leaves from the strawberries and weigh them again. Mine came to around 900g, so I adjusted my amount of sugar accordingly (i.e. 450g). Cut the strawberries in to little pieces and mix with the lemon juice and the gelling sugar. Pop a lid or cover on top and leave to infuse for an hour. Finely chop the mint leaves and set aside for later. After an hour, bring your mixture to the boil, stirring continuously, and keep stirring and boiling for 4 minutes, or according to the instructions on your packet of sugar. Carefully you don’t get burned by any splashes from the bubbling hot mixture! Skim any foam off the top with a slotted spoon, stir in the mint leaves, and fill the mixture in to your clean jam jars. This was just a small batch, as brambles are only just coming in and still quite expensive. But I love them, so I couldn’t resist. It was perfect though for using up the gelling sugar left over from the other two jams. Wash the brambles and finely chop the thyme leaves. Mix the brambles, lemon juice and thyme with the gelling sugar and leave to infuse for an hour. Pop a lid or cover on top and leave to infuse for an hour. After an hour, bring to the boil, stirring continuously, and keep stirring and boiling for 4 minutes, or according to the instructions on your packet of sugar. Carefully you don’t get burned by any splashes from the bubbling hot mixture! Skim any foam off the top with a slotted spoon, and fill the mixture in to clean jam jars. Do you have any favourite jam combinations? Please feel free to share them in the comments below!